Works great where I needed it. It took a long time to put together. Honey-Can-Do CRT-06346 Rolling Craft Storage Cart, White. 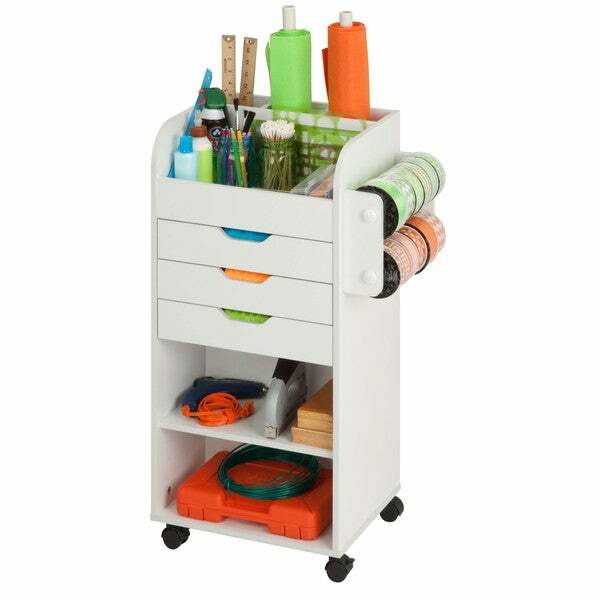 Keep your crafting materials organized with this convenient, rolling storage cart. Featuring three built-in storage drawers and two dowels for hanging ribbon, this storage center is ideal for storing crafting supplies or gift wrapping necessities. Also included are two built-in shelves and slots for storing rolls of wrapping paper. Flat, upper storage area is great for organizing smaller items. Four wheels make this cart portable and allow you to craft from any room in the house. This is actually handy when finished, but the materials are cheap particle board that will not likely withstand a move, and the instructions say .5 hours for two people, but takes about an hour and a half, so I do not think worth the money.